A haunting book at best. I have to admit that this is my second reading of this book and I was much more wrapped up in the story this time than the first time I read it. I'm not sure why. Either I had my mind on other things which made it hard to get into the story, or the story was so subconsciously disturbing that I could not wrap my head around what it was about. The first time I read it, I kept trying to figure out the "world" that these children were living in. What were they talking about when they used the word, "completion?" I couldn't quite digest the fact of what they were for because I was wrapped in who they were and following along in their emotional adventure of their lives. 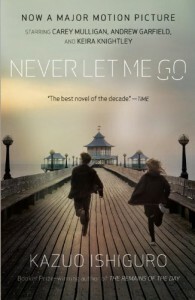 I originally expected a somewhat typical dystopian story with a literary twist, but "Never Let Me Go" is much more deeper and intense. Kazuo Ishiguro took a very personal and emotional approach to telling his story. It's written in first person and the narrator's (Kathy) voice actually changes as she grows up. The writing perspective caters to how they are discovering their own emotions and vague to the harshness and the details of their short lives. "Never Let Me Go" is the coming of age story of a group of clones who were created for the purpose of donating their organs and their lives to science. What sets this book apart is the haunting perspective of how these clones come to the understanding of who they are and their purpose for existence. I think this is what makes this book so emotionally charged. While living in what could be construed as a modern day boarding school, these clones go through the confusion and questions that all teenagers go through, but their real purpose in life clouds any real understanding of the world around them. Their desire to be known is an impossible one in a world that sees them as disposable body parts. Honestly so many analogies could start here regarding young people today that the list would go on and on in great length. Do clones have souls? Can they love? I suppose that is something we will all eventually find out as science marches onward to the time when human clones will be created.